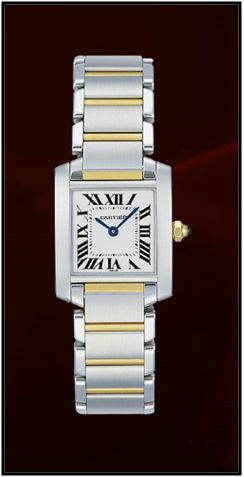 Like all Cartier watches, this Tank Francaise small model for women expresses class in a beautiful way. Encased in 18K yellow gold, as well as steel, this watch is elegant and is a great accessory for every occasion. This watch has sapphire crystal with a silver-grained dial. Be ready to sparkle with this beauty. One thing that people may love or hate about this watch is that it uses Roman numerals rather than regular numbers. I think it adds class to the watch; however, some people don’t like that. Cartier likes to use sword-shaped blue-steel hands, as well as quartz in their timepieces. This watch is another that is equipped with those hands and quartz movement Cartier caliber 057. This gorgeous watch can be taken out on the sea for trips as well, as it is water resistant for up to 30 meters/100 feet. What’s great about this watch is that it comes with a free engraving and free bracelet adjustment. So if you find that your watch is too loose or too tight, you can have that adjusted for free! Also, this makes a wonderful anniversary or mother’s day gift. With the free engraving, you can customize and personalize this watch to fit your needs. Also, all Cartier watches are shipped in a free elegant gift box if you so choose to order it with one. I would have to say my favorite thing about this watch is the overall look of elegance. I can just imagine wearing this watch to an important dinner, a lovely date, or even an interview. This watch is very versatile too, so it can be worn on regular outings such as trips to the grocery store, visits with the family, and even to work. I wouldn’t suggest wearing it while working out at the gym or while going on camping excursions. This watch is listed at $6,300. Although this watch is quite expensive, it comes in 18K gold and is full with sapphire crystal, steal, and is even water resistant. You truly get what you pay for when you purchase this watch. • Dimensions: 24.34×20.3 mm, 5.94 mm thick.